Sarai Jacobi’s days used to be utterly predictable. Each morning at 7, she would leave her home in Nyakonge, Tanzania and walk four kilometers with her donkey to collect water for her family of six. Sarai Jacobi of Nyakonge, Tanzania, right, by the new pump that brings water to her village. The water came from a seasonal water hole, and neither the amount nor the quality of the water Jacobi and her donkey were able to bring home was satisfactory. “The water was dirty, saline and unpleasant to drink,” she says. “Sometimes I had to share that small amount of water with my neighbors, and sometimes I had to make two trips a day, which would keep me busy from early morning up to 6 p.m.” Lack of water meant Jacobi had to make tough choices, often deferring clothes-washing to special days when she had enough time to get to a local stream. “Bathing was the least in the priorities for water,” she says. 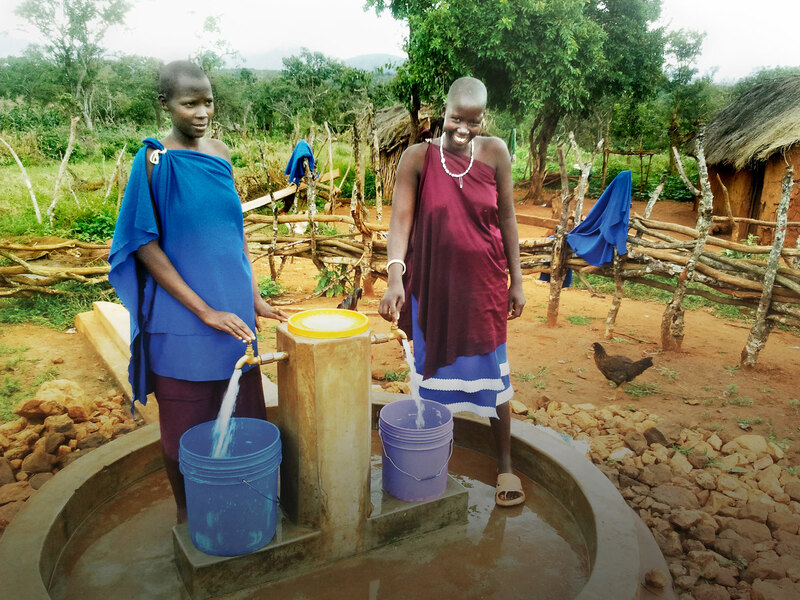 Much has changed for Jacobi and her neighbors in Nyakonge, thanks in part to assistance provided by the USAID-funded iWASH program, which is part of the larger Global Water for Sustainability Program (GLOWS). Implemented by Winrock, the program eliminated the need for long treks to unreliable water holes by introducing improved technologies and infrastructure to meet the water needs of communities around Tanzania. Taking what’s known as a multiple-use water services (MUS) approach, iWASH began with an assessment of each community’s domestic as well as income-generating water requirements, including agriculture and raising livestock. That evaluation guided the planning, financing and management of the systems needed to provide reliable water. Importantly, one requirement of the program was that new water services had to be “demand-driven,” meaning that communities had to be willing to contribute financially and otherwise to the construction and maintenance of new water services. It’s an approach that allowed the program to provide improved water access to nearly 200,000 Tanzanians.